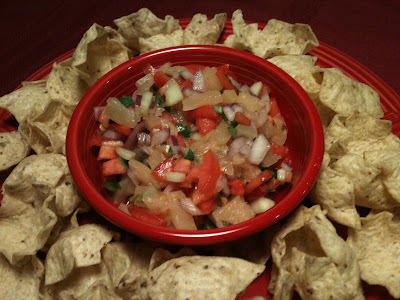 Mmmmm pineapple salsa. I adapted this recipe from the pampered chef seasons best cookbook (spring 09) Its sweet and tangy with a little bit of bite. Add more jalapeno to make it hotter.... but whatever you do be careful when cutting that sucker. My thumb is still burning. 5. Toss all in a bowl. Looks super yummy! I LOVE your spicy beef and brocoli stirfry! !